Koh Phangan Utopia Resort has a wide selection of accommodation available; the cheapest are Utopa Standard Rooms, while at the other end of the scale are the concrete modern western luxury bungalows. All accommodation types come with air conditioning, hot water, minibar, shower or bathtub and some even with a jacuzzi, plus UBC cable TV and your personal DVD player. The accommodation at Phangan Utopia Resort is built and finished to high standards with a total of 33 constructed rooms and bungalows in a range of styles and prices. All rroms are tastefully decorated with sunset sea views over Mae Haad Beach and down the western coast of Koh Phangan. All bungalows have bathrooms with Western fittings and come in a range of styles and prices to suit every traveller.The emphasis is on quality and style and every effort has been made to ensure the rooms are comfortable, clean, quiet and a pleasure to be in. 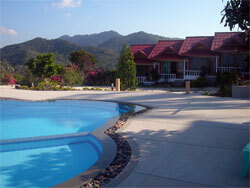 Phangan Utopia prides itself on its modern facilities and high level of service that the resort provides. The swimming pool is one of only a few on the island and is situated next to the sea view terrace with uninterrupted views over Chaloklum Bay and the Gulf of Thailand. There are poolside sun-loungers and umbrellas to cool off under, and tantalizing cocktails, fruit shakes and local beers are available at the restaurant. The friendly and professional staff, modern facilities and well maintained grounds go well with the beautiful natural surroundings, providing the perfect setting for you to relax and unwind in this luxurious paradise. The Phangan Utopia SeaView Jacuzzi Bungalow and the Phangan Utopia SeaView Bathtub Bungalow includes deluxe decor and cozy ambience which offer you a peaceful relaxing stay. The rooms veranda overlooking an unsurpassed sea view is perfect for enjoying a drink or chat with your loved one. These rooms feature two floors with more personal space and panoramic sea view offering an unforgettable stay. The decor inside the rooms is pleasing with soft cotton sheets and a range of luxury furniture. Phangan Utopia Resort also offers an extensive variety of cuisines to suit everyone's taste, excellent service and an idyllic ambience in choices of restaurants & bars. The Phangan Utopia Standard Bungalow are built in a Thai / Mediterranean style and are located just next to the swimming pool; all coming with air conditioning and ensuite western bathroom as standard. All bungalows are great value for money, spacious inside, well-furnished and private balcony. The bungalows are most suitable for 2 persons, but an extra bed can be fitted at more cost. These bungalows are positioned on the hillside so that all have wonderful sunset sea views. The Phangan Utopia Modern Mountain View Bungalows are newly build and located just next to the swimming pool offering offering amazing views over lush tropical gardens. All rooms come with air conditioning and ensuite western bathrooms. Although there are many rooms, care has been taken to ensure that the wonderful natural beauty of the area remains and the bungalows have been positioned so as to blend in with the landscape and rich tropical gardens. It's the perfect place to hang in a hammock on the balcony, with a scenic seaview and spend lazy time reading or taking naps. The Utopia Modern House Bungalow is a two story building and you can either choose to stay in the upstair or downstair room. The Phangan Utopia Classic SeaView Bungalow offers stunning views over the Gulf of Thailand in a private and cosy atmosphere. All of the rooms offer air conditioning and have western bathrooms, are fully fitted and furnished and have spacious balconies with fascinating views over the Gulf of Thailand and nearby Chaloklum Bay and Mae Haad Beach. The Utopia Luxury SeaView Bungalow is designed to touch the beauty of the sea while you can take the fresh sea breeze on the terrace. The villa is set along the slope of the hill. Each villa is provided for the maximum of 2 persons but an extra bed can be fitted at more cost. The bathroom is designed for your comfort and relaxes. You can lay your back in the bathtub to relax or take a refreshing shower. The Phangan Utopia Classic Thai Style Bungalow are spacious and maticualtely built with local wooden materials and located in our tropical garden. These Classic Thai Style Bungalows have been newly refurbished. All the bungalows have air conditioning, private bathrooms, hot shower and large open balconies. These bungalows are set amongst wonderful tropical gardens with manicured lawns and romantically lit paths. These rooms come with a double bed and are located on the hillside in our tropical garden with fantastic views over the gulf of Thailand. The bathrooms are ceramic tiled and fitted to Western standards. The emphasis is on quality and style and every effort has been made to ensure the rooms are comfortable, clean, quiet and a pleasure to be in. Let our friendly service and relaxed atmosphere present you a truly enjoyable memory. The Phangan Utopia Pool Rooms are situated just next to the swimming pool offering spectacular views over the gulf of Thailand and nearby Chaloklum Bay. These 5 mediterranean style deluxe rooms have been decorated in warm colours that blend in with the wonderful natural surroundings. These Air/Con rooms are tastefully decorated and fully furnished and very spacious. These modern style rooms are set amongst lush tropical gardens that have been tastefully designed to create a wonderful open natural environment. The newly built swimming pool is just a couple of meters away. Equipped with airconditioning, private bathroom, hot shower. This deluxe modern style room comes with American breakfast in the morning and for your private entertainment there's even a TV and your personal DVD player. The wide open balcony offers stunning views over the gulf of Thailand.